Boxee has always surprised everyone with its lightning fast and unique interface. 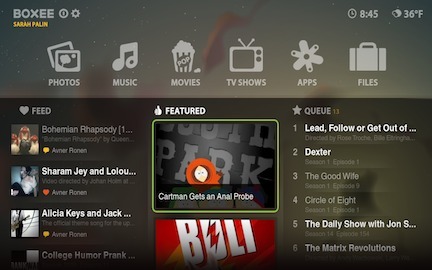 Boxee is like the Google Chrome of Multimedia apps. It is truly a revolutionary application. Only a month has been passed since the official release of Boxee Beta and you have a newer version of Boxee Beta up for grabs. Boxee Beta has no new feature additions as such and is solely focused on bug fixes. Here are some of them. Multilingual keyboard support: under settings-appearance-region to add keyboards. Significantly improved video quality of our DXVA support. Fixes to iPhone remote keyboard under Linux. Fill list of changes here. 150,000 new users joined boxee after the release of Boxee Beta. 3 Million(!!) Boxee Apps launched. 1.5 million TV episodes and Movies were watched. Not familiar with Boxee? Watch this. Download this newer version of Boxee Beta. You may need to sign up first to download. In Ubuntu, download the deb package and all it needs is a double-click.